Turkey Book Talk episode #59 – Ceren Baysan of University of California, Berkeley on her paper “Can More Information Lead to More Voter Polarization? Experimental Evidence from Turkey.” The study was based on voter surveys in the months before the April 2017 referendum on granting President Erdoğan more powers and also measured Turkish parties’ own polling operations. Baysan measured Turkish voters’ opinions about various issues as well as the major parties’ own polling operations: How much they know about voters’ preferences and how they adapt their work in light of that information. The report is full of interesting insights about the state of Turkish parties and the deep polarization that is only getting worse in the country. Here’s a link to download/read the report itself. The Kayhan Delibaş book mentioned in the episode is called “The Rise of Political Islam in Turkey: Urban Poverty, Grassroots Activism and Islamic Fundamentalism.” Here’s an interview with Delibaş on his research. Turkey Book Talk episode #57 – Karabekir Akkoyunlu, research associate at the University of Graz, on “Exit from Democracy: Illiberal Governance in Turkey and Beyond” (Routledge), a collection of 10 essays he co-edited with Professor Kerem Öktem. Listen out for details of our brand new Turkey Book Talk membership system – giving members a range of exciting extra perks. Please spread the word about Turkey Book Talk and the new membership scheme. New Turkey Book Talk episode with Michael Wuthrich, chatting about “National Elections in Turkey: People, Politics and the Party System” (Syracuse University Press). This really is an excellent book that overhauls much conventional wisdom about Turkish politics shared by right and left. Unlike the deceptively boring title of the book, this episode’s title is stupidly ambitious. But we do cover a lot of ground. I’m really pleased with it – hope you enjoy/learn from it. Here’s my review of the book in HDN. If you like this podcast and want to support independent podcasting, you can make a small or large monetary donation to Turkey Book Talk via Patreon. Many thanks to current supporters Özlem Beyarslan, Steve Bryant, Andrew Cruickshank and Aaron Ataman. Ece Temelkuran joins Turkey Book Talk to discuss “Turkey: The Insane and the Melancholy” (Zed Books), her vivid and personal account of the current state of the country. My review of this one is pending – waiting for it to be published in the TLS before posting in abridged form in Hürriyet. If you like Turkey Book Talk and want to support independent podcasting, you can make a small or large monetary donation to the show via Patreon. Swimming against all economic logic, another new national newspaper appeared on Turkey’s newsstands last month. 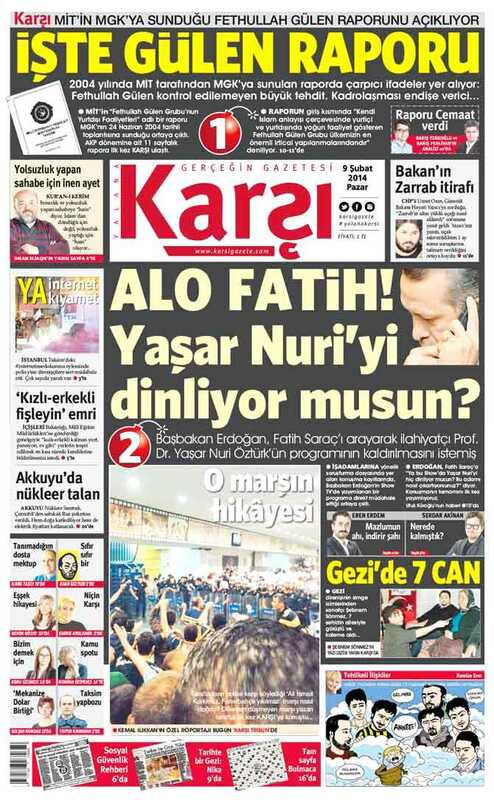 Karşı means “against” or “anti” in Turkish, and this new daily has a slogan declaring it “Against lies, the newspaper of the truth,” apparently channelling the spirit of Çarşı, (the Beşiktaş football club supporters group whose motto is “against everything”). Karşı has quite a varied team of people working on it, but in many ways it embodies Turkey’s chronic “opposition problem.” The fragmented opponents of the Justice and Development Party (AKP) comprise leftists, liberals, Kemalists, nationalists, communists, environmentalists, anti-capitalist Muslims, and now Gülenists. But together these forces not only fail to make up a majority of the Turkish electorate, they are also handicapped by their diversity; the opposition is so disparate that it can agree on little other than that the AKP is a disaster. The anti-government Gezi Park protests that raged throughout last summer made this point particularly clearly. The protests were full of energy and ideas, but it was the kind of energy that can’t be channelled through traditional political channels. The variety that made the Gezi movement so strong and impressive is exactly what prevents it from being an effective opposition force in more formal terms. What’s more, all Turkish opposition has to contend with a highly cohesive and disciplined incumbent government, confident in the loyalty of its core conservative constituency and backed by a well-oiled media and electoral machine. Karşı’s first front page on Feb. 9. The headline reports PM Erdoğan’s order to hapless Habertürk controller Fatih Saraç, demanding that he cut a live broadcast in which Islamic theologian Yaşar Nuri Öztürk criticised the government. In a recent Reuters piece about the durability of the AKP’s appeal, Hakan Altinay of the Brookings Institution is quoted as saying that there is “no political force to pick up the ingredients and cook a better meal, the opposition has no sense of direction.” Indeed, it is commonly assumed that the main opposition Republican People’s Party (CHP) is too clumsy and loaded with its own historical baggage to be effective. There’s some truth in this, but it’s hard to see how anyone could channel the disaffection of Turkey’s hugely varied opposition into a single coherent political party, while at the same time outlining a vision that can defeat the AKP at the ballot box. Similarly, Piotr Zalewski wrote last week that the CHP would “have to deliver more than just finger pointing for Turkish voters to entrust it with running the country.” That’s also true, but the party is paralysed by the fact that finger pointing is pretty much the only thing that unites those ranged against the government. A more constructive platform might target wavering AKP voters (however few they are), but that would likely risk losing the CHP’s own wavering voters. It’s an almost impossible balancing act. Of course, none of this is particularly new, but it has become particularly obvious in the lead up to the March 30 local elections. The new newspaper Karşı – with its diverse but incoherent range of ideas about what is to be done – perhaps embodies the Gezi conundrum. As its editor-in-chief Eren Erdem has said: “The Gezi spirit excites us, and we are talking the same language as the people on the streets during the Gezi resistance. From our writers to our editors, from our printers to our correspondents, we all imagine a free world.” Of course, Karşı is a newspaper, not a political party, but its example does indicate the challenge facing any formal opposition hoping to capitalize on the AKP’s current problems.